“Cynthia Ke Sapne / The Dreams of Cynthia chases the inner life of its primary protagonist. Cynthia is at once imagined as a literary character, a measure of time, a form of experience and a landscape. 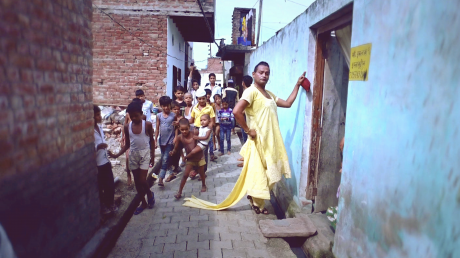 She also bears witness to the lives of two people – an executioner and a trans artist whose lives are intertwined within a small town in North India and with each other through an informal history of labour, violence and death. In conversation with a contemporary Hindi poem of the same name by poet Anish Ahluwalia, the work levitates on the surface of language, identity and memory. Freed from the imperatives of producing experience as evidence Cynthia uses poetry as atmosphere. At once an accidental encounter and a long deferred meeting, she invites you to a world where nothing is to be found out, but much is to be discovered. Another name for the moon, Cynthia is sometimes spotted outside the window as stories of a city slowly tumble in. This entry was posted in Pallavi Paul and tagged AV Festival 2018, Pallavi Paul. Bookmark the permalink.